The Broke and the Bookish : Paula gets to see John Green! GUYS! So this past Saturday was pretty exciting for me, as some of you may or may not know, John Green recently released his new book "The Fault in Our Stars". And as a part of its promotion, he's been touring the US. Thankfully I was lucky enough to live in a city that his tour stopped in and got to see him (and his (vlog)brother Hank Green joined him as a special guest. I got to the event pretty early (thankfully- because it was sold out and I managed to snag a fairly close spot) and spent my hour people watching and finishing "The Fault in Our Stars". The first thing we were greeted with was Hanksock (a puppet from vlogbrothers) who did a little act and told people to take as many pictures as they wanted etc etc, and then introduced John. 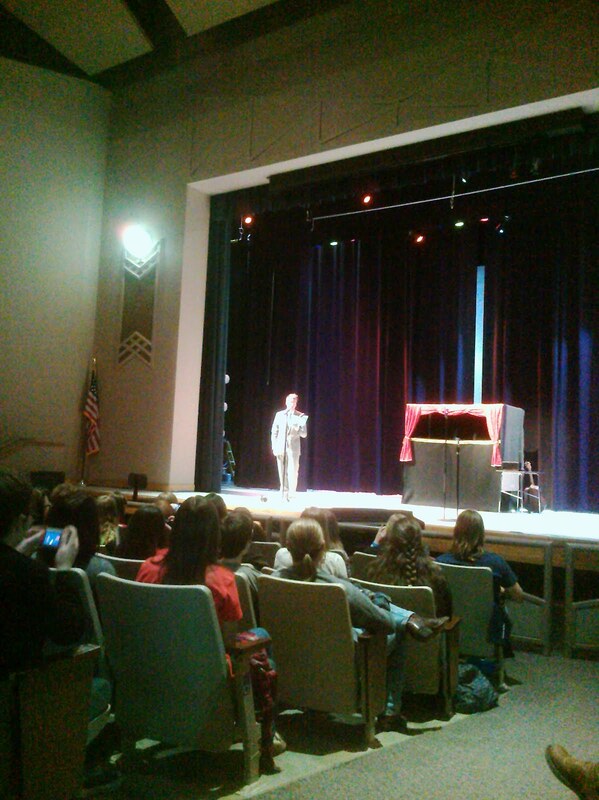 John came out on the stage and read an excerpt from the book (most of Chapter 2). I found this super exciting because as I was reading the book, I imagined it as John reading it, and it was awesome hearing how he placed emphasis on certain things that I didn't. It was also amusing hearing him talk as a 16 year old girl. He also talked about his inspiration for the book, which was working as a hospital chaplain over a decade ago. He explained that he's been working on this novel since then, and it kept getting put off because he didn't know what the story actually was about. He then explained that he finally knew how to write it after he met his friend Esther Earl (who the book is dedicated too), who has since lost the battle to cancer. After that Hank played some songs. 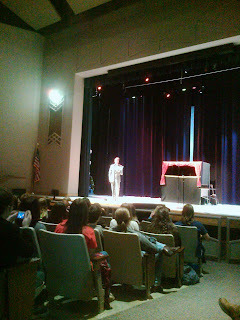 One was about the book (and also from the character's perspective, so we got to hear Hank be a 16 year old girl also). After that he sang some of his original songs - some of which were about Harry Potter. All of which were wonderfully nerdy. Next up was Q&A. John did part of it on his own specifically about "The Fault in Our Stars" (or his other books). There was a mix of thoughtful and silly questions. Unfortunately the thoughtful answers have slipped my mind, but some of the other questions were "Why do all of your female characters have green eyes" or "Why do all of your female characters wear blue nail polish?" Both of which he said were coincidence. After his time was up Hank joined him and they had a vlogbrothers Q&A. Which as an added bonus (so neither one would hog the time and lots of people were able to get questions answered) - whoever was talking when the buzzer went off (Hank) got shocked. They talked a lot about various projects they are working on and answered questions about Hankgames and how Vlogbrothers got started. Then sadly the event was over and the line for signing began. Thankfully I was able to switch my letter (originally had S, switched for an M) with someone else and I only had to wait about 45 minutes. Since they only had 30 seconds of interaction time per person, I had to plan what I was going to ask carefully.... I finally settled with "Is it your intention to make me sob in public every time I read your books in a coffee shop?" He replied that it was his intention to make me laugh, and hopefully my tears were from laughter. I told him they were tears of joy because his writing is wonderful. It was a pretty good night, Huzzah! and DFTBA nerdfighters! I haven't read anything by John Green (yet) but have a couple of his books on reserve from the library. 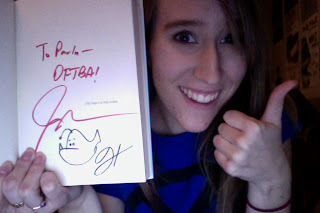 I recently became aware of the awesomeness that is John Green and need to read the books asap. So awesome! I'm going this Saturday! I can't wait! It looks like it'll be a lot of fun! Awesome! I'm jealous you got to meet Hank. I went to a signing in Indiana last spring (right before John moved to Amsterdam for a few months) and wow was it fun! I had to wait about 2 hours to get my books signed, but he signed all 4 of them and I got to thank him for writing TFiOS (even though it hadn't come out yet) because it's a topic I've had personal experience with. His signings are always so much fun, I wish his tour was coming to the Ohio area. Awesome! I'm so jealous!! Thanks for letting me live vicariously! Yayyyy! I'm going on the 31st - last stop of the tour and only Canadian stop! So glad I managed to snag tickets. They sold out really fast! Thanks for sharing the story! It made me feel like I got to go which, unfortunately, I didn't, since they didn't stop anywhere near me. I'm so jealous! That is amazing! I am waiting for the day when I can attend an author's book tour. The first book I read by John Green was Looking For Alaska and that book has stuck with me forever. I may have to grab a copy of The Fault in Our Stars. I have heard may good things about. I'm jealous! I'm stuck in the big section of the country he avoided (but really Kentucky we're not midwestern we're just always ignored, lol).